Folks who work at universities have heard more commencement speeches than the rest of us--that's part of the job. So when reader Kathy Schuetz, a communicator at the University of Maryland, wrote to suggest Margaret Edson's 2008 commencement speech at Smith College and called it "remarkable," I took notice. We bring nothing into the classroom -- perhaps a text or a specimen. We carry ourselves, and whatever we have to offer you is stored within our bodies. You bring nothing into the classroom -- some gum, maybe a piece of paper and a pencil: nothing but yourselves, your breath, your bodies. Classroom teaching produces nothing. At the end of a class, we all get up and walk out. It’s as if we were never there....Classroom teaching expects nothing. There is no pecuniary relationship between teachers and students....Classroom teaching withholds nothing. I say to my young students every year, “I know how to add two numbers, but I’m not going to tell you.” And they laugh and shout, “No!” That’s so absurd, so unthinkable. What do I have that I would not give to you? Set up a clever contrast to make your point: Edson spends several paragraphs telling us about the "nothing" of classroom teaching, underscoring that it yields nothing tangible. Along the way, you realize that this "nothing" is yet substantial, meaningful, rewarding. Then Edson carries that line of thinking through and transitions it to the future that lies ahead for the graduates: "If you can point to something, you might lose it, or you might break it, or someone might take it from you. As long as you store it inside yourself, it’s not going anywhere -- or it’s going everywhere with you." Suddenly, that nothing sounds pretty good. Sly humor suggests they're all in on the joke together: Edson builds a bond with her audience from the start, using the typical salutations to honored guests and her hosts humorously (speaking of her own class, she deadpans, "when the history of the college is written, the record will note that this class was the best looking"). She pokes fun at trite honorifics, gently, and uses an exaggerated tone to suggest she, too, finds some of the pomp a bit much. For college graduates and faculty who've heard one too many commencement addresses, it's just the right touch. Speaking without notes: Whether you use notes or not is up to you and the speaking situation--there's nothing wrong with it. But here is a lovely example of what speaking without notes can do for a speech, particularly a commencement address with a big crowd to engage. The lack of notes lets her address the audience while looking at it directly, something every audience craves. As a result, she connects with this audience in a way many commencement speakers never do. 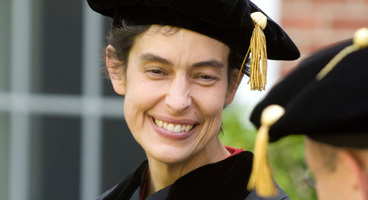 2008 Smith College Commencement Margaret Edson from Smith College on Vimeo. Looking for famous speeches by women? Check out The Eloquent Woman Index of Famous Women's Speeches, with a wide variety of women speakers, types of speeches and topics to inspire your next speech. Each one comes with lessons for speakers, plus video or audio and a transcript, where available.